Clashes appear to have subsided after UN-brokered truce took effect in port city, a lifeline for millions of Yemenis. 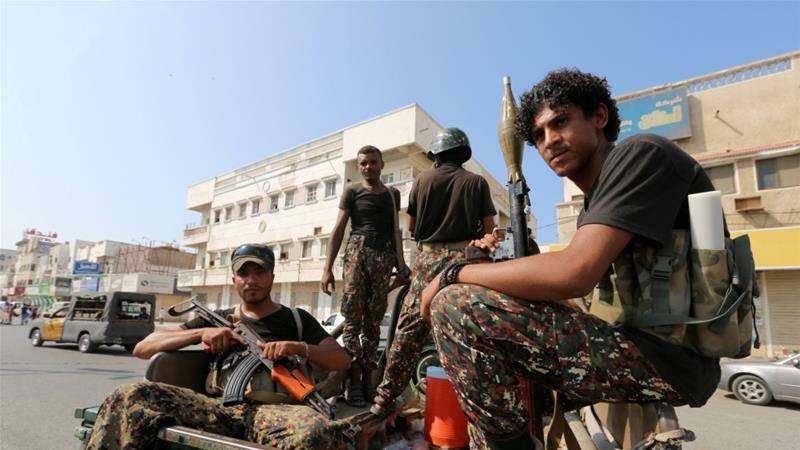 A fragile calm has taken hold in Yemen’s western city of Hodeidah, just hours after a UN-brokered ceasefire deal between Houthi fighters and forces loyal to the government came into effect. Residents in the city told Al Jazeera that fighting had subsided by 12:00 GMT on Tuesday, despite the sound of sporadic gunfire ringing out in parts of the city. Cease-fire in Yemen holding, U.N. envoy says. Fragile calm in Yemen’s ceasefire hub, Hodeida. Erdogan: Positive answers in call with Trump, but says Turkey could act against US-backed Syrian Kurds ‘anytime’. Russia, Iran, Turkey seek deal on Syria constitutional body at UN. Iraq’s parliament confirms cabinet ministers, but divisions remain. Iran-backed militia leader back as Iraq’s National Security Adviser. Saudi Arabia raises spending in new deficit budget. UN: Hezbollah tunnels on Israel-Lebanon border violate truce. Afghanistan sends team to join Taliban peace talks in UAE. New Russian barracks on disputed Kuril islands draws protest from Japan. Xi Jinping: China will never seek global economic dominance. Xi Jinping says no one can ‘dictate’ China’s economic path. Sri Lanka’s prime minister returns, but ‘crisis is far from over’. Comoros court jails another 20 opposition figures. New Zealand to hold cannabis referendum in 2020. African Swine Fever spreads to 22 provinces in China as year of the pig approaches. Armed group blocks key Libya oil field for a week. Cameroon military says it killed 7 suspected separatists. Nigeria’s presidency expresses ‘concern’ over Amnesty activities. Tension soars in Togo ahead of parliamentary election. Candidates’ private TV stations battle it out in Madagascar vote. DRC’s new electronic machines ‘could help rig election’. Funding crisis threatens UN air drops in C.Africa: WFP. UK prepares for no-deal Brexit. Britain placing 3,500 troops on standby in case of no Brexit deal. Russia to deploy warplanes to Crimea amid Ukraine standoff. Russia condemns U.N. resolution on Crimea, Ukraine. Serbia and Kosovo clash over army at UN Security Council. Kosovo president: Decision to form army ‘irreversible’ . Hungary’s opposition plans more protests after ‘slave law’ passes. Greek police accused of beating migrants trying to enter from Turkey. Pompeii will evacuate people to Sardinia by boat if Vesuvius erupts. $5 billion for his border wall? Trump eases shutdown threat. Leading contenders emerge to replace Zinke as US Interior secretary. Trump charity agrees to dissolve amid allegations of a ‘shocking pattern of illegality’. Trump accuses Facebook, Twitter, Google of Democrat bias. Huawei arrest may dash Canada’s hopes for ‘essential’ trade deal with China. Paraguay arrests 18 police over Brazilian inmates’ escape. Colombia: six killed at site of notorious 1990s massacre as violence returns. US Senator McConnell moves to force vote on Trump’s counterterrorism nominee. U.S. assault on al-Shabab underscores growing threat: ‘It’s coming back in ways that are disturbing’. German police raid Berlin mosque over suspected ‘terror financing’. Elon Musk’s SpaceX set to raise $500 mn: report. Twitter detects ‘unusual activity’ from China and Saudi Arabia. Former CBS boss Les Moonves denied $120m exit pay. Beyonce Sings 'Happy Birthday' to Diana Ross at Her 75th Birthday Party — Watch!